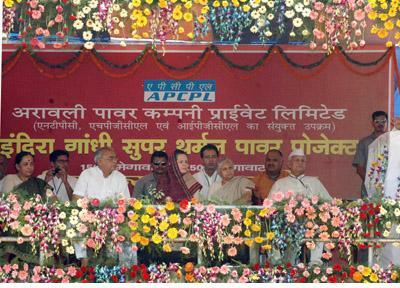 The Union Minister Power Shri Sushil Kumar Shinde addressing at the Laying foundation stone ceremony of the Indira Gandhi Super Thermal Power Project at Jhajjar in Haryana on October 07, 2007. The Chairperson, UPA, Smt. Sonia Gandhi, the Chief Minister of Haryana, Shri Bhupinder singh Hooda and the Chief Minister of Delhi, Smt. Sheila Dikhsit are also seen.